The “Just LIVV” EP now available in all online stores featuring “Tear Down the Walls”. Click on the Music or EPK links above to hear LIVV’s self-produced recording of “Oh Holy Night”. LIVV is a 15 year old American singer-songwriter from the New England area and has been performing in both small and large venues since the age of 11. She has been seen performing National Anthems at major events all over New England including the New England Patriots, Boston Celtics, Boston Red Sox, New England Revolution, NASCAR and Monster Energy Super-cross. Her first single, "Tear Down the Walls" was released in late 2017. She released her first double EP on July 20th, 2018. In a unique music release scenario, there are two volumes. Vol. one includes her first 5 songs which were recorded when she was 13 with a more youthful tone and message of confidence for young girls everywhere to live out their fairytales. Her second volume remains youthful but contains 5 songs that are slightly more mature with vocal quality and messages that reflect her development and experiences as an early stage teen going through the transition from middle school to high school. Her powerful vocals accompanied by a confident spirit and caring attitude shine through in her debut EP's and are capturing the ears and hearts of her growing fan-base. LIVV started recording and training at studios in Boston when she was 11 years old. 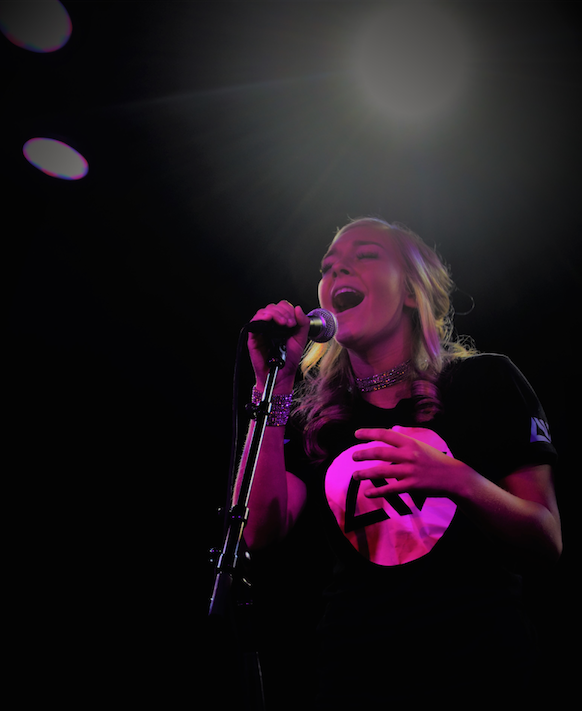 She was thrust into the spotlight when she won a New England area talent show where finalists performed live on the Boston waterfront and the winner earned the chance to sing before thousands of fans at a NE Revolution MLS game. She caught the ear of the New England Patriots with that performance and was asked to perform the national anthem in front of a packed house in Gillette. From that moment on, LIVV began stunning crowds with her amazing renditions of the "Star Spangled Banner" at nearly every major sporting event in the Boston area. The world champion New England Patriots were compelled to invite her back for a repeat performance. Other notable performances started to line up including multiple appearances for the Boston Celtics, Boston Redsox, Nascar, Monster Energy Super-cross and the NBA Hall of Fame. Even MA and NH Governors and Senators have invited LIVV to sing at key events ranging from closed door inaugurations and ceremonies at state capitols to live radio shows in the Boston area. LIVV embraces the challenge to inspire the world to be a better place through the gifts of song and voice. Currently in the middle of basketball season. Events starting in the spring!